Some films will never get old. Timeless classics with life-changing stories, inspiring actors, and genius direction that all work together to create pure magic. Learn more about cinema, the world and yourself from the 100 best movies of all time. Reunite with your heroes and remember the scenes that made you laugh and cry. Whether you are a serious film buff or just starting your journey through the world of cinema, you will love this interactive poster. Display it on your wall to show off your impressive movie-going experience or challenge yourself and track your progress. Watch the iconic movies that are truly worth seeing at least once in your lifetime. Our genre-spanning list is is filled with movies loved by audiences worldwide - from 20th century classics to modern blockbusters and award-winning animation. We created original illustrations for every movie on our list. Scratch off the gold layer and reveal your favourite heroes or fun symbols from the movies you have seen. Enno Vatti Top 100 Movies poster comes in a premium quality box, neatly wrapped in protective paper. Instantly ready to gift to your movie-loving friends! 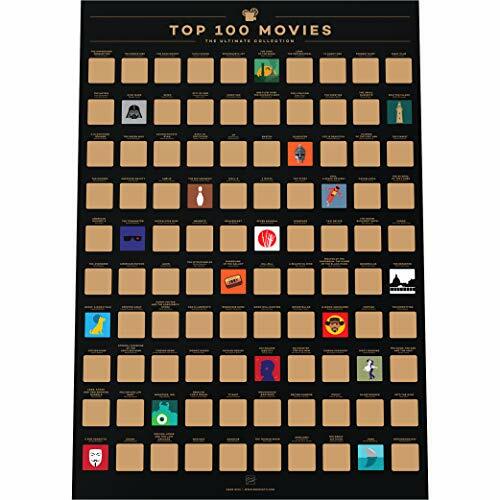 TOP RATED MOVIES - our poster is filled with films loved by both fans and critics worldwide - from influential classics to modern blockbusters and award-winning animation. 100 COLORFUL ICONS - it is so satisfying to find the symbol of that great movie you have just watched. We created 100 original illustrations that you will not find anywhere else. TIMELESS DESIGN - there is already enough visual noise in our lives, so we designed our poster to be as non-distracting as possible. Perfectly fits A2 size frame (16.5 x 23.4 in). SUPREME QUALITY - with more than 50000 posters shipped to satisfied customers worldwide, you can trust us to deliver the best possible print quality and scratch-off experience. PREMIUM PACKAGING - your new poster will come in a premium quality box, carefully hand-wrapped in protective paper. Ready to gift to your movie-loving friends!